Think I may have found a new favourite colour! Wardour Mews in all it's duochrome goodness! In the bottle there's plums, golds and dusky pinks. Once applied (3 coats for full coverage) there are also red and green sparkles. It makes me think of molten rose gold. I'd planned on embellishing slightly with Gingerbread on my ring and thumb and I'm very pleased with how well they compliment each other. 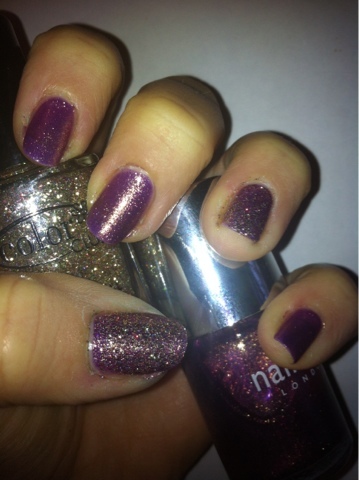 In the bottle it's your bog standard gold glitter with a slight holo glitter but when applied on top of Wardour Mews it enhanced the gold and pink shimmer. The red in the holo really stands out in this combo. I really am loving this combo! I love Wardour Mews! I bought it in a box set the other day and I'm in love. I'm a new follower so hello! A shout out to Beads & Bobs! NOTD: OPI Fly & OPI Gone Gonzo!